Baked goods are delish! AMIRITE?! The bummer is that most baked goods are made with white flour, white sugar, and have very little to no fiber. I wanted to create a nutritious recipe for all the times I want a bakery treat. Drum roll please … Quaker Fig & Flax Oatmeal Bars are a great snack made from simple ingredients including Quaker rolled oats, flax seeds, olive oil, honey, and figs. Have a bar with a cup of ginger tea for dessert or crumble a bar in some plain lowfat Greek yogurt as a snack. 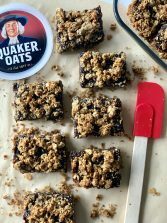 I use Quaker oats in many of my recipes because just a ½ cup serving of whole grain rolled oats is considered a good source of fiber, which can help support a healthy digestive system and provide important vitamins and minerals. In a food processor, pulse 1 cup of Quaker oats until a flour-like consistency. Remove from food processor and set aside. Place dried figs in a small pot and cover with water. Bring to a boil and simmer for 3 minutes. Drain figs (reserve some liquid). In the empty food processor, puree figs and 4 tablespoons of simmering liquid until smooth. Set aside. In a medium bowl, mix together oat flour, remaining oats, flaxseeds, baking soda and salt. Add in oil, honey and plant milk. Stir until combined. Coat 8x8 pan with cooking spray. Press 1 cup of oat mixture into bottom of pan, spread on fig puree, and crumble on remaining oat mixture (will not cover top entirely). Bake for 25 minutes, until golden. Let cool and cut into 12 bars. Keep leftovers in fridge for up to 5 days or frozen up to 3 months.